Beer Tap Handles — Mark Supik & Co.
MSNBC visited our shop and produced this 5 minute video about the beer tap handle production. If you can't pay us a visit, take a look. Welcome to Mark Supik & Co. Beer Tap Handles. We make wooden tap handles for craft breweries. All of our handles are made of local hardwoods from Maryland & Pennsylvania and reclaimed lumber. We provide many natural wood handles to our customers, but also offer durable paint finishes if desired. All of our tap handles are made in our woodworking shop in Baltimore, Maryland. Ferrules come from Connecticut, labels come from South Carolina. Laser, silk screening, custom cut wood shapes and hand painting is all done by local Maryland craftspeople. Once you have reviewed this catalog, please email or call us with your order or questions. You can contact Will at beertaps@marksupikco.com or call at (410) 732-8414. It is always helpful to see your logo and any basic design ideas (whether a photo, scan of a quick sketch, or computer- generated sketch). From there we can provide some mockups for you to consider. Download our catalog (click on photo above) for a full description of our design process and photos and specifications on our 45 shapes. Included in the catalog are our most popular tap handle shapes and styles, ready to be customized with your wood choice, finishing style and labeling. Crafted from local woods, cut, turned, sanded, painted and silk screened by our staff in Baltimore. Easy to use adhesive labels & brass and aluminum ferrules all made in USA. Four to six week turn around. If you are brewing beer, kombucha, coffee, cider or mead, contact us about tap handles. No minimums, we are ready to grow with you. 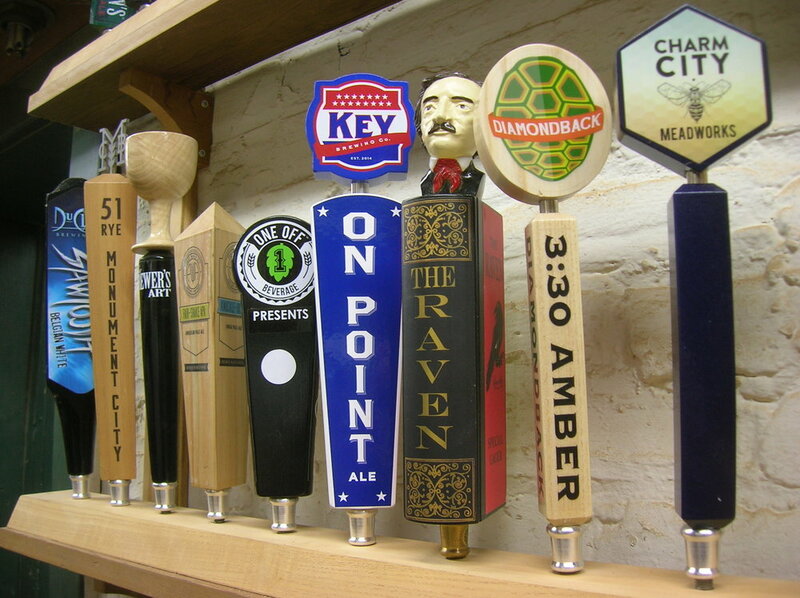 We ship our tap handles all over the country, but are very happy to work with many brewers in Maryland.